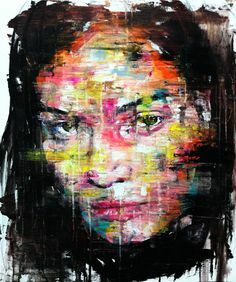 It's an old cliche that the eyes are the windows to the soul, and this reason this cliche has such staying power is never more noticeable than in the artwork of KwangHo Shin. A young artist, but a definite rising star, Shin has begun to make a name for himself with a portraiture style that is uniquely his own - part abstract expressionism, part hauntingly blurred realism, and all fixated on the eyes of his subjects. In a recent interview, Shin was asked about the focus on eyes, and replied, "Why do people obsess about the eyes in my paintings? I was never asked about the presence of nose or lips. I think this suggests that the energy that eyes have in paintings can control the emotions of the works significantly." Working in a blend of charcoal, acrylics and oil paints, Shin creates portraits on a grand scale, towering well above both artist, viewer and subject alike. He has already been identified by a number of artistic institutions as an artist whose career deserves careful attention, most notably by the Saatchi Art initiative's 'One to Watch' program, which maintains a lookout for up and coming young artists. They also recommend that an investment in his work now may pay off big dividends later if his career continues on its current trajectory. With pieces available for as little as $320 USD, it's hard to go wrong as an investment. Even if his career doesn't click into the cachet of the art world that makes artists go big, you'll still wind up with a beautiful work at a bargain price. Interestingly, he refuses to title any of his works, but he draws subjects from any number of pop culture icons as well as non-celebrities, though the most recognizable subject of his to date is likely his untitled portrait of John Lennon. Currently, he is exhibiting in Singapore, at Yavuz Gallery, with a collection of self-portraits collectively entitled Face Me. In the previously mentioned interview, conducted by PopSpoken, Shin had this to say about the show: "Recently, I had experienced seeing myself through other people, from their reaction to my works. Through this show, I want to remind myself who I really am and the importance of my existence in my works." That's some good advice for any aspiring artists who are hoping to make a name for themselves, whether in portraiture or otherwise! Be sure to keep an eye on his career.